Stamped "Zell GS AM Harmersbach Handgemalt Opatija"
Good, with no chips. Some shrinkage crazing to glaze on interior of bowl. More properly described as pipkins, but most likely the remnants of a fondue set, the pattern name of these items is named after the popular resort town of Opatija in Croatia about 90 km from Trieste. 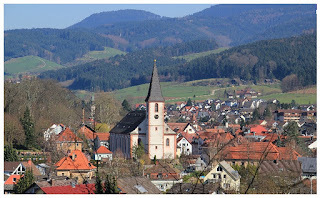 They are marked on the back as being made in Zell Am Harmersbach, a small historic picture postcard Black Forest market town in Baden-Wurttemberg Germany. 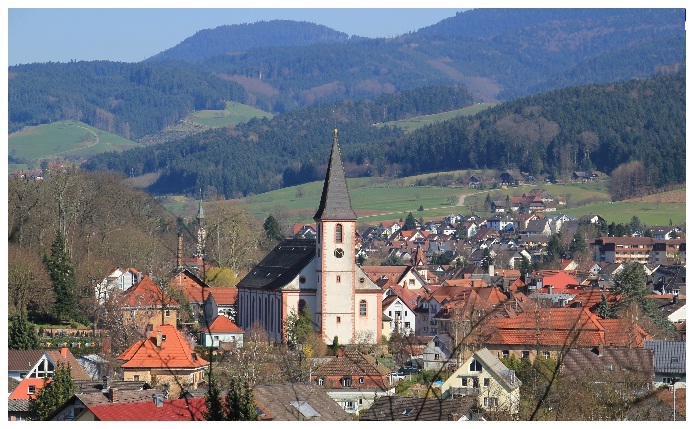 Zell Am Harmsbach is the home of the Hahn und Henne (Rooster and Hen) pottery factory. Fabulously kitsch in the manner of those modern 1970s multicoloured vases the Germans made. So tacky that one of my followers would love them. Like many long-term makers, they have experienced highs and lows. Known today as "Zeller Keramik'. We know (because of typical German efficiency) that the pottery opened on the 22nd of October 1794 when Joseph Burger began an earthenware pottery. Almost half their production was porcelain by the mid 19th Century. The late 19th and early 20th Centuries saw two town fires almost destroy the works, known as the Upper and Lower Factories, just outside the town gates. By 1925 they employed over 500 people, but Georg Schmider died in 1934. His son-in-law Heinrich Heiss took over the business, then Heinrich's son Gunter ran the company later on. Unlike a lot of German businesses, they operated successfully for a time during World-War-2. Flower pots were not high on the list of targets for Bomber Command; but they had to close for a few years from 1942 because of a shortage of raw-materials. They recommenced in 1946 and eventually closed the old Upper Factory in 1963. The recession of the late 1980s saw another disaster averted when a Real Estate company took them over in 1988. Like Denby in England, their parent-company got into difficulties and the pottery was sold in 1994. Known as Zeller Keramik Geschwister Hillebrand G.m.b.H since 1997, the company still continues successfully today. There is also a porcelain museum operating from the old Haiss manor house. 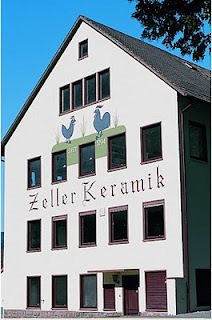 I have added a bit more about this company on the post for Zeller Keramic if you are interested.